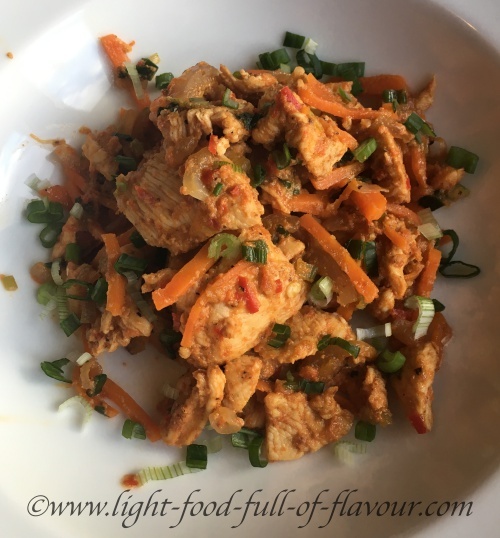 I start by marinating the chicken I use in this delicious chicken stir-fry – and I’m using kefir in the marinade. Kefir is a fermented milk drink and like all fermented foods it can help to increase healthy bacteria in our bodies. If you can’t find kefir though, you can use either buttermilk or full-fat Greek-style yogurt instead. I’m also using another not so common ingredient in the marinade – sumac - which is a really lovely, citrusy spice derived from the red berries of the sumac shrub. Again, if you can’t get hold of it you can replace it with lemon juice. I add roasted red peppers (bell peppers) to the marinade. You can buy roasted peppers in jars but I prefer to do it myself. Yes, it means more work but it’s not difficult to do. The chicken should preferably be marinated for a minimum of 3 hours – longer if you can. Start by making the roasted peppers. Pre-heat the oven to 220C/425F/gas mark 7. Cover a baking tray with baking parchment, place 2 large red peppers (I use pointed peppers) on the tray and place it in the oven. Roast for about 15 minutes – turning them over half-way through – until the skin blackens. Once ready, place the roasted peppers in a bowl and cover with cling film. Set aside for 10-15 minutes, until the skin comes off easily. Break open the peppers, pull out and discard the stalk, pith and seeds and peel off the skin. Place all the ingredients for the marinade in a blender and whizz for about 30 seconds. Put the marinade in a non-metallic bowl and add the sliced chicken. Mix well, cover the bowl with cling film and place it in the fridge for a minimum of 3hours. Add 1 tablespoon of olive oil to either a wok or large frying pan over a high heat. Once the oil is hot, add the sliced onion and carrots to the pan and keep stirring for a couple of minutes. Place the vegetables in a bowl and leave to the side. Fry the marinated chicken, and all of the marinade, in batches for about 3-4 minutes until the chicken slices are cooked through (don’t over-crowd the pan as this will make the chicken cook slower). Place each batch in the bowl with the vegetables until you have fried all the chicken slices. Place everything back in the wok/frying pan and add the sliced spring onion (scallion). Stir for another minute until all the food is piping hot. This chicken stir-fry goes really well with cauliflower rice. Or simply add sliced broccoli as well as the onion and carrots to the stir-fry.